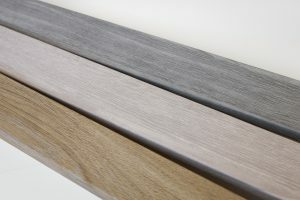 aluplast has launched Woodec, a next generation foil which replicates the natural appearance of timber while combining it with the through-life advantages of PVC-U. Delivering a step-change in PVC-U laminate technologies the new range of surface finishes are available across the German system house’s core Ideal 70 and contemporary Ideal 4000 system, plus its new Smart-Slide inline sliding door and flush casement sash and Lift-and-Slide Patio. This includes three ultra-life-like woodgrains: Turner Oak Malt, a subtle light oak finish; Sheffield Oak Alpine, a silvered oak finish; and slightly darker, Sheffield Oak Concrete. Ian Cocken, Director of Sales and Marketing, aluplast, said: “The realism is exceptional. When you look at it on a frame it’s almost impossible to distinguish it from a timber product. Woodec is on a completely different level to traditional foils. “It represents a massive area of opportunity for fabricators and installers. You can touch it, feel it, it replicates the warmth of timber but in a low maintenance product. The shift is without a doubt as significant as the move to colour foils from white PVC-U. This is the next generation of foiling from aluplast. Specially developed for the UK market aluplast, launched its new flush fit casement sash in September. Developed to offer ultra-slim sightlines with a low chamfer running out to the IGU, it’s been developed to integrate fully with both the established aluplast Ideal 70 and Ideal 4000 systems. The German-systems leader followed its launch in October with the Smart-Slide Inline sliding door, which combines ultra-smooth running and easy intuitive operation. Capable of spanning openings of 5.85m wide by up to 2.5M high, the 70mm sliding door system has been developed to deliver significant efficiencies in fabrication and exceptional through life performance. Cocken continued: “The innovation that we have delivered this summer continuing through into the autumn, builds on the product launches we’ve already delivered including aluskin, our aluminium cladding system. “This forms a very comprehensive offer but one very closely aligned to key trends within the window and door industry including flush casement sashes and the growth seen in colour and foils. At the last count the installed value of PVC-U windows jumped by 8% on the back of growing demand for traditional timber-effect jointing and flush casements (Palmer). This is most clearly illustrated in the window market, where a 1.2% increase in the market overall to 6.82m frames, was outstripped by the increase in installed value of 5.5% to £2.38bn. Something which according to Palmer, was driven by demand for foils (up 45% since 2013.